The seeded rib stitch pattern is a beautiful textured pattern that's guaranteed to spice up your knitting. Basically it's a mixture of the seed stitch and ribbing. Amazing isn't it, how you can mix up different patterns like that and end up with something so lovely. Pretty isn't it? The seeded rib doesn't pull in as much as regular ribbing does so it may not work well for cuffs on sleeves. But it will work beautifully as an allover stitch pattern or maybe some edgings that don't need the tightness of regular rib stitching. It just depends on what you're making. One thing to keep in mind is that it does spread out quite a bit so knitting a gauge swatch would be a good idea. Think it looks really complicated? Guess what, It's actually very simple and you'll probably have the pattern memorized after a couple of rows. 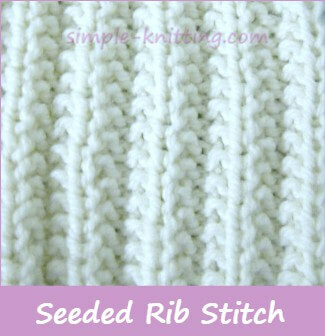 What can you make with the seeded rib stitch? You can knit anything with this eye-catching pattern - pullovers, cardigans, scarves, hats, dishcloths and tea towels. And just a note here, it's great for guys too. If you'd like to knit a sample you'll need to cast on 11, 15, 19 or 23 stitches. But wait a minute. 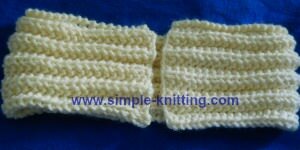 Now that you know how to knit the seeded rib stitch pattern, I decided to create a pattern for you to practice with. 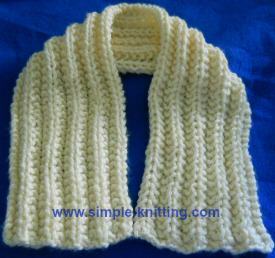 I thought you might enjoy practicing the seeded rib stitch pattern by making a scarf. Here's all the details. Notes: You can use any kind of yarn with this scarf pattern. You'll just need to add more or less stitches depending on how thick your yarn is. And remember to add/subtract in multiples of 4. I added 2 extra stitches in order to have nice clean edges. On every row slip the first stitch as if to knit and always knit the last stitch. What that means is you're moving the first stitch from the left needle over to the right needle without knitting it. Make sure you snug it up on your needle. Knit it very long, bind off and fold up each end to make pockets. Make them any depth you like. Seam up the sides and you have a nice pocket scarf. Knit it 36 inches long, bind off and seam the ends together for a cowl. Knit it 36 inches long, bind off and make an infinity scarf. I'll show you how in a minute. Of course you can also knit it longer if you'd like to wrap it around your neck a couple of times. The choice is yours. Repeat these 2 rows until you reach 36 inches or desired length. 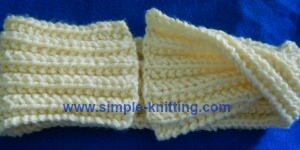 For a simple but very pretty scarf/cowl just seam the two ends together. For an infinity scarf take one end and flip it over just like in the photo to have that twist in there. Seam it up.